A simple-to-use interface for users to compute Win Probabilities (WP) for NFL plays based on a built-in WP model. A robust framework for improving estimates of WP. 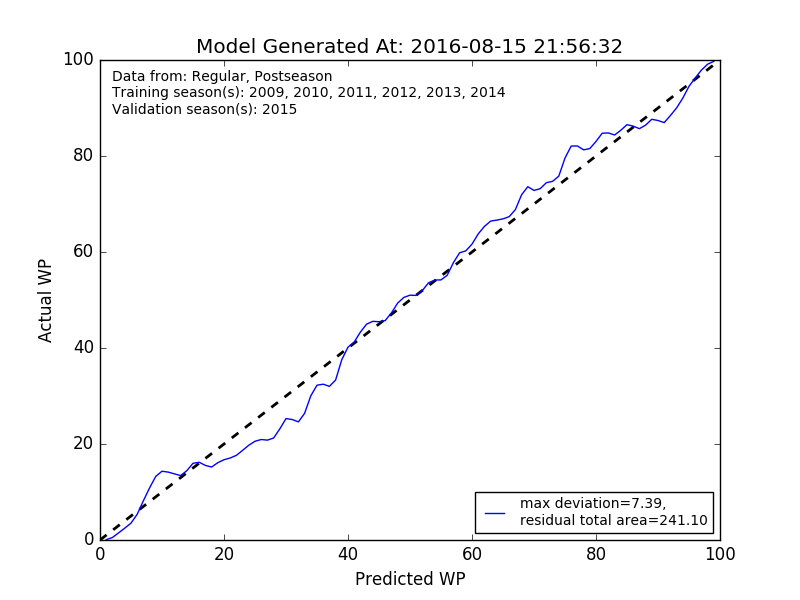 NFLWin builds on scikit-learn’s fit-transform idiom, allowing for pipelines that take in raw box score data and return estimated WPs - all data preprocessing takes place behind the scenes. Additionally, these preprocessing steps can be easily reordered, replaced, and/or extended, allowing for rapid iteration and prototyping of potential improvements to the WP model. NFLWin also has built-in support for efficiently querying data from nfldb directly into a format useable by the built-in WP model, although the model is fully data-source-agnostic as long as the data is formatted properly for the model to parse. NFLWin depends on SciPy, which is notoriously difficult to install properly via pip. You may wish to use the Conda package manager to install Scipy before installing NFLWin. Put simply, there are no other options: while WP models have been widely used in NFL analytics for years, the analytics community has almost totally dropped the ball in making these models available for the general public or even explaining their algorithms at all. For a (much) longer explanation, see the PhD Football blog. © Copyright 2016, Andrew Schechtman-Rook. Revision a940b339.